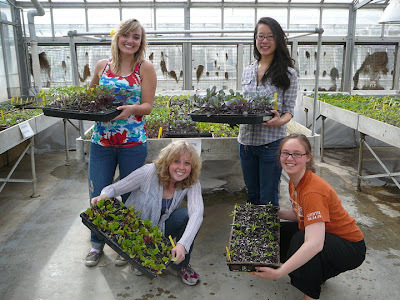 Cultivating Community: Look at what we've grown! This past semester we've been spending a lot of time at the Matthaei Botanical Gardens doing some planting for the plant sale. The volunteers have been a huge help with planting, trasplanting and giving input throughout the process. We've grown many types of plants from the traditional tomatoes, broccoli, peppers, & hundred of hot peppers, to novelty plants such as cheddar cauliflower, totem endive, pac choi, and my personal favorite, the Dill's atlantic giant pumpkin! We started most of the seeds using the "common pot" method, meaning we planted all of the seeds we wanted in a 5" common pot. Then once the seeds sprouted, and the plants became larger, we transplanted them into four packs. 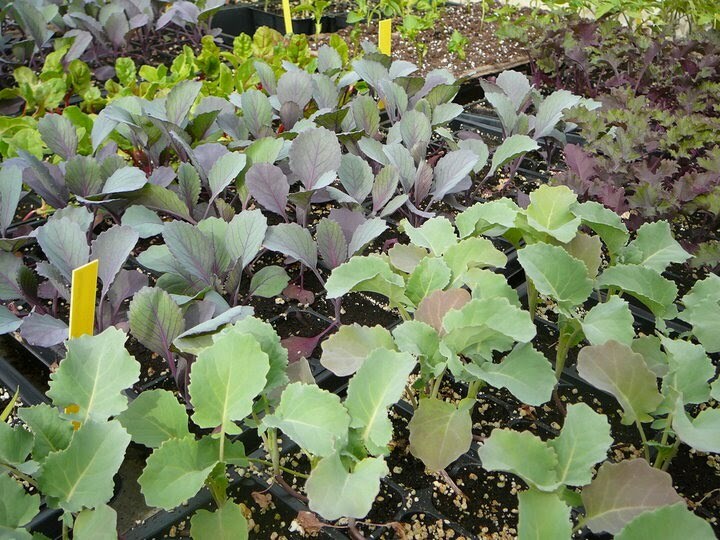 (see the photo below of some of our cabbages and broccoli in four packs). Some of the plants even outgrew the four packs and were transplanted into larger, 3.5" compostable pots. Plants that don't like their roots to be disturbed, such as the greens mixes, were planted directly into their four pack cells to avoid them being unhappy about being transplanted from common pots into four packs. Some of the plants that grow larger very quickly, (i.e. the pumpkin, cucumber, melon, and watermelon), were directly sown into larger pots. These plants had excellent germination rates, and were immediatly happy with the large space available to them. For all of the plants, we used an organic soil mixture, and watered them frequently. Additionally, an organic fish fertlizer was used to give the plants a little boost before the sale. 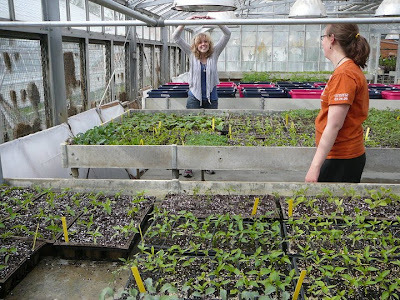 It was a lot of work transplanting the over 3,000 plants that sprouted, but we also found some time for fun! One of the many laughs we had was over how many hungarian hot wax peppers we got, 435 to be exact. In fact, we still have some if anyone has a passion or use for hot peppers, we'd be happy to give you some! Special thanks to all of our volunteers for helping to make the plant sale a huge succes, and also to Adrienne for giving us advice and keeping us on track!